Our sense of smell is the most potent of the five. Smells strongly evoke memories, and our memories can either make us feel at ease or put us on edge. Of course, we’re talking about sleep in this blog post, so we’re interested in those ease-filled memories, like the ones you get when you smell cookies baking or someone lights a vanilla-scented candle. Those ones that just make you feel like you’re safe and home, you know? Only we want these scents to do more than give you the warm and fuzzies; we want these scents to knock you out, metaphorically speaking. First, you want to make sure you’re using pure essential oils for your pillow and linen spray. And if you’re able, choose organic options. Do a little research before you buy; the internet will most likely be able to tell you what’s legit and what’s not. You want to make sure and use calming scents that promote relaxation, rather than those that are intended to increase energy and boost mood. The goal is to fall asleep, after all! Scents like lavender, patchouli, bergamot, and chamomile are good options. Avoid citrus and minty scents such as lemon, sweet orange, and peppermint. Eucalyptus is an obvious no-no. It might have those cute little koalas yawning, but it’ll make your senses snap to attention like whoa. Making your own pillow spray is surprisingly easy. And once you gather all of the necessary ingredients, you’ll be set for quite awhile. 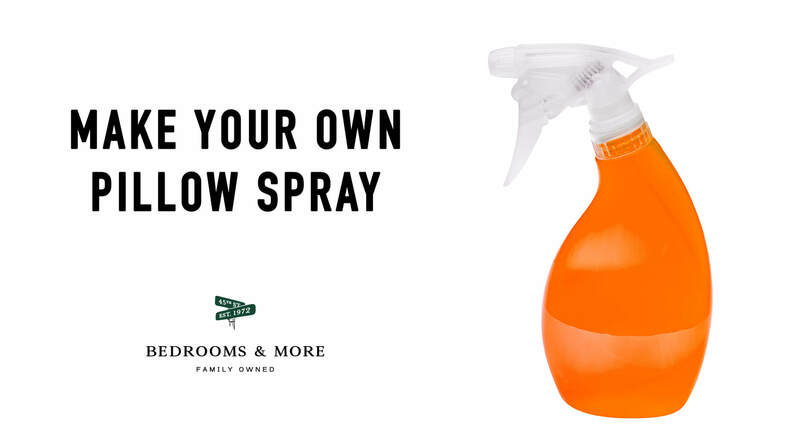 In fact, you’ll most likely realize you love your pillow spray so much you want to share it with family and friends. Did some say homemade holiday/birthday gifts? Yes, please! That’s it! I bet you’ve already got one or two of those ingredients lying around the house already. The rest you can pick up at your local grocery store or pharmacy. If you struggle to find the tinted glass spray bottles – we recommend glass because essential oils tend to erode plastic – you can find great deals online. First, fill your spray bottle about 3/4 of the way with spring water. Second, add in about a tablespoon of witch hazel/ clear alcohol, whichever you have on hand. Third, add in your essential oil(s). You can find so many different recipes for mixing scents. I usually opt for between 10-20 drops of whatever combination I’m using. But if this is your first batch, it might be a good idea to stick to one scent. Lavender is a great, safe bet. Fourth, screw on the spray cap, tip upside down a few times to mix, and voila! You have your pillow spray all ready to take you off to dreamland. Pretty simple, huh? This entry was posted in Blog, chemicals, Bedding, Sleep, Pillows and tagged natural, pillow, sleep.